For other uses, see Spring. 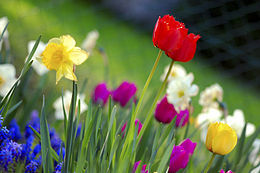 Spring is one of the four temperate seasons, following winter and preceding summer. There are various technical definitions of spring, but local usage of the term varies according to local climate, cultures and customs. When it is spring in the Northern Hemisphere, it is autumn in the Southern Hemisphere and vice versa. At the spring (or vernal) equinox, days and nights are approximately twelve hours long, with day length increasing and night length decreasing as the season progresses. Spring and "springtime" refer to the season, and also to ideas of rebirth, rejuvenation, renewal, resurrection and regrowth. Subtropical and tropical areas have climates better described in terms of other seasons, e.g. dry or wet, monsoonal or cyclonic. Cultures may have local names for seasons which have little equivalence to the terms originating in Europe. Meteorologists generally define four seasons in many climatic areas: spring, summer, autumn (fall) and winter. These are demarcated by the values of their average temperatures on a monthly basis, with each season lasting three months. The three warmest months are by definition summer, the three coldest months are winter and the intervening gaps are spring and autumn. Spring, when defined in this manner, can start on different dates in different regions. Thus, in the US and UK, spring months are March, April and May, while in New Zealand and Australia, spring conventionally begins on September 1 and ends November 30. Swedish meteorologists define the beginning of spring as the first occasion on which the average daytime temperature exceeds zero degrees Celsius for seven consecutive days, thus the date varies with latitude and elevation. In some cultures in the Northern Hemisphere (e.g. Germany), the astronomical vernal equinox (varying between 19 and 21 March) is taken to mark the first day of spring, and the summer solstice (around 21 June) is taken as the first day of summer. In Persian culture the first day of spring is the first day of the first month (called Farvardin) which begins on 20 or 21 March. In other traditions, the equinox is taken as mid-spring. In the traditional Chinese calendar, the "spring" season (春) consists of the days between Lichun (February 3–5), taking Chunfen (March 20–22) as its midpoint, then ending at Lixia (May 5–7). Similarly, according to the Celtic tradition, which is based solely on daylight and the strength of the noon sun, spring begins in early February (near Imbolc or Candlemas) and continues until early May (Beltane). The beginning of spring is not always determined by fixed calendar dates. The phenological or ecological definition of spring relates to biological indicators, such as the blossoming of a range of plant species, the activities of animals, and the special smell of soil that has reached the temperature for micro flora to flourish. These indicators, along with the beginning of spring, vary according to the local climate and according to the specific weather of a particular year. Most ecologists divide the year into six seasons that have no fixed dates. In addition to spring, ecological reckoning identifies an earlier separate prevernal (early or pre-spring) season between the hibernal (winter) and vernal (spring) seasons. This is a time when only the hardiest flowers like the crocus are in bloom, sometimes while there is still some snowcover on the ground. During early spring, the axis of the Earth is increasing its tilt relative to the Sun, and the length of daylight rapidly increases for the relevant hemisphere. The hemisphere begins to warm significantly, causing new plant growth to "spring forth," giving the season its name. Any snow begins to melt, swelling streams with runoff and any frosts become less severe. In climates that have no snow, and rare frosts, air and ground temperatures increase more rapidly. Many flowering plants bloom at this time of year, in a long succession, sometimes beginning when snow is still on the ground and continuing into early summer. In normally snowless areas, "spring" may begin as early as February (Northern Hemisphere) or August (Southern Hemisphere), heralded by the blooming of deciduous magnolias, cherries, and quince. Many temperate areas have a dry spring, and wet autumn (fall), which brings about flowering in this season, more consistent with the need for water, as well as warmth. Subarctic areas may not experience "spring" at all until May. While spring is a result of the warmth caused by the changing orientation of the Earth's axis relative to the Sun, the weather in many parts of the world is affected by other, less predictable events. The rainfall in spring (or any season) follows trends more related to longer cycles—such as the solar cycle—or events created by ocean currents and ocean temperatures—for example, the El Niño effect and the Southern Oscillation Index. Unstable spring weather may occur more often when warm air begins to invade from lower latitudes, while cold air is still pushing from the Polar regions. Flooding is also most common in and near mountainous areas during this time of year, because of snow-melt which is accelerated by warm rains. In North America, Tornado Alley is most active at this time of year, especially since the Rocky Mountains prevent the surging hot and cold air masses from spreading eastward, and instead force them into direct conflict. Besides tornadoes, supercell thunderstorms can also produce dangerously large hail and very high winds, for which a severe thunderstorm warning or tornado warning is usually issued. Even more so than in winter, the jet streams play an important role in unstable and severe Northern Hemisphere weather in springtime. In recent decades, season creep has been observed, which means that many phenological signs of spring are occurring earlier in many regions by around two days per decade. The peculiarities of the reversing ocean currents in the Pacific. In some regions,[which?] the first spring festival of the new year is Carnival, 40 days before Easter. Easter eggs, such as this Ukrainian one, signify the Resurrection of Jesus. Easter is the most important religious feast in the Christian liturgical year. Christians believe that Jesus was resurrected from the dead on the "third day" (two days after his crucifixion), and celebrate this resurrection on Easter Day, two days after Good Friday. The date of Easter varies between 22 March and 25 April (which corresponds to between 4 April and 8 May in the Gregorian Calendar for the Eastern and Oriental Orthodox Churches using the Julian Calendar). In the Southern Hemisphere Easter occurs during autumn. 1 May is the date of many public holidays. In many countries, May Day is synonymous with International Workers' Day, or Labour Day, which celebrates the social and economic achievements of the labour movement. As a day of celebration, the holiday has ancient origins, and it can relate to many customs that have survived into modern times. Many of these customs are due to May Day being a cross-quarter day, meaning that (in the Northern Hemisphere where it is almost exclusively celebrated) it falls approximately halfway between the spring equinox and summer solstice. In the Celtic tradition, this date marked the end of spring and the beginning of summer. ^ "Spring". Glossary of Meteorology. Retrieved 5 March 2018. ^ "Met Office: Spring". Retrieved 5 March 2018. ^ "Do you want the dates of our seasons changed?". New Zealand weatherwatch. Retrieved 2014-05-09. 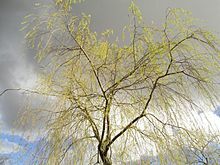 ^ "Australian Bureau of Meteorology - Climate Glossary - Seasons". Australian Bureau of Meteorology. bom.gov.au. Retrieved 2018-03-30. ^ "Sweden braces for warm spring weather". Thelocal.se. Retrieved 2013-01-07. ^ Michael Allaby (1999). "A Dictionary of Zoology". Archived from the original on 2013-06-02. Retrieved 2012-05-30. ^ Anthony Aveni, "The Easter/Passover Season: Connecting Time's Broken Circle," The Book of the Year: A Brief History of Our Seasonal Holidays (Oxford: Oxford University Press, 2004), 64–78. ^ Anthony Aveni, "May Day: A Collision of Forces," The Book of the Year: A Brief History of Our Seasonal Holidays (Oxford: Oxford University Press, 2004), 79–89.